This entry was posted in Uncategorized and tagged Kajal Aggarwal, Magadheera, Rajamouli, Ram Charan, Telugu, Thursday Telugu, Tuesday Telugu by mredlich21. Bookmark the permalink. I watched this movie without any idea of who Raajamouli is,much before Baahubali and was struck by the visual brilliance,imagination and the overall heady entertainment.The hero recognising heroine via touch that’s like a spark,him chasing her bus on a horse,the race across white desert and the epic 100 soldiers kill-it was a movie unlike anything that was around then.Warriors,princesses, archery,horses were not so common in Indian movies then as it is now.Add to that,the background scores and music that elevates the experience. I think this movie was like Raajamouli’s training ground before he went full blast on Eega and Baahubali. So I think it’s natural that anyone who has watched Baahubali will find this movie lacking in story,setting, characters, visuals & overall appeal.That just means Raajamouli as a director, is striving to better his previous -successful- attempts unlike other populist directors like Farhan Akhtar,Raju Hirani,SLB etc whose initial movies are their best works and the quality since then,has been steadily declining.I can’t wait to see what he does next.His level of imagination & fast paced story telling is unmatched by anyone we have around now. I didn’t get a notification of this comment, it is the weirdest thing! Anyway, that’s why I answered Vennela first even though you were “first” in line. Really interesting point about Rajamouli. Sometimes I feel that when directors are given fully control as a reward for their previous successes, it ends up just showing their weaknesses. To use SLB as an example, Khamoshi is my favorite film of his because he had to be so imaginative and work with so many restrictions. And then the more freedom he had, the more he seemed to get away from the imaginative ways of working around problems. Same with Munna Bhai and Hirani. I’m trying to think of another director that got better the more freedom he had, and the only ones that come to mind at the moment are Raj Kapoor, Guru Dutt, and Yash Chopra. But they also (except for Guru) ended up having a decline. There was the struggle to prove what they could do, and then freedom as they scaled the heights, and then the decline as they aged and lost their brilliance. That’s a depressing thought! I hope Rajamouli is still at the Shree 420 point of his career with plenty more brilliance to come, not at the Dil To Pagal Hai point when it just turns into rehashing old ideas without the old spark. You just described the standard path followed by many actors and directors. Start out as simple, brilliant beings,find critical/mass acclaim,transition into stars/star directors or brands,start hiding behind fan expectations,and then repeat oneself over and over. I can still justify actors to some extent cos they have rather limited choices of what’s being offered and have to abide by fans to a large extend. But star directors who thrive on their ‘brand of cinema’ serving the same kind of movies again and again are mere formula following,lazy egoists who has no respect for audiences. Very nice review of the film. It is not in the same league as Bahubali but when it released, it was a big hit and still entertaining in bits and pieces. I always forward Brahmanandam bits though!! I think I mentioned it my comments earlier that Kajal being passive may be a plot point. Her passivity is the reason why her father makes decisions for her. Dev Gill doesn’t object to a woman on throne, he objects to a woman who retreats when assaulted on throne. Not that he is looking out for the kingdom but there won’t be a competition for her hand if more people think she is capable of ruling (For ex Rudramadevi or Arundhati). Oh good, I’m not the only one who fast-forwards the Brahmanadan sequences! Yes! During that scarf scene, I couldn’t help thinking about how Anushka or Tamannah in Bahubali would have handled that moment. It’s not that Rajamouli can’t write active women, it’s that in this film he wanted Kajal to be inactive. As far as I could remember, they would never touch in the warrior flashback while jumping from the cliff – he’d try but fail to catch her hand. This mistake was trolled well at the time of release. That’s right, it was a really clever concept, because they never managed to touch at the moment of death, touching hands in the present is what set the story up again and completed it. And that explains everything. All “forced” parts were boring, but the parts when Rajamouli could use his imagination are so good. I forgot how I love Dheera Dheera; it’s my mood booster. And we should put white desert scenes on “the sexiest scenes” list. I didn’t have any feelings for Ram Charan durning almost all movie, but when I saw him in the desert in those white pants and with a sword I was like: WOW. I love Dheera Dheera too! It seems like one of the few moment when Rajamouli was really allowed to follow his own vision. I love the Superman part, it surprises me everytime I watch the video. Okay I think I might be in the minority but I think Ram Charan pretty much outclasses Prabhas in all the departments – Acting, Body, looks, and of course dancing. Definitely dancing, maybe looks and body, but not so much acting. At least comparing this film to Bahubali, which isn’t really fair since Prabhas had the much better role and years more experience at that point. I’ve never really liked Prabhas in anything, so i would probably rate Ram Charan higher. I haven’t seen the movie but your review is totally awesome and i’m going to watch the movie now. You write very well also. Like I have posted before, I don’t analyze the films. I just let them wash over me and make me feel good. Occasionally, I watch the ones I like over and over and pick up directorial moves and catchy plot points. But they don’t necessarily add to my original enjoyment. I am paying attention to DCIB reviews, however and getting smarter. 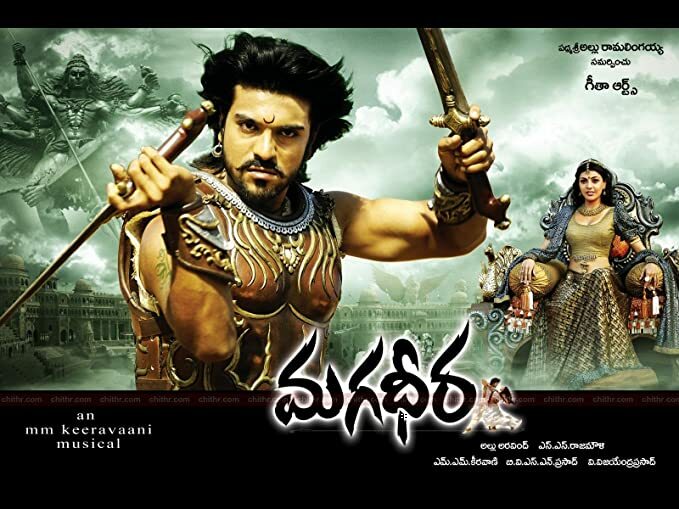 Magadheera is a favorite although as far as historical and fantasy movies go, I prefer Bahubali, my all-time best, even over Paadmavat and Asoka. And as Telugu actors, Prabhas and Allu Arjun over Ram Charan, no matter how well he can dance. BTW, If you have a list of (not too old) historicals or films with historical sequences, please tell me. I’m sure I missed a few good ones. I too am a Brahmadan and Jonny Lever fast-forwarder; glad not to be the only one. Kajal doesn’t move me. Anushka does. I’ll watch whatever she makes, even the duds, and there have been some. A blizzard is raging outside. I’m going to warm my soul now with Dheera Dheera. There will be a lot of them this year: Kalank, Panipat, Manikarnika, this one with Suniel Shetty and Mohanlal.